In my first kunmihimo jewelry (bracelet), I used only cords, combining two colours to make a piece. I loved the outcome and so do people who saw it. I got my bobbins and s-lon thread so I decided to take the next step by adding beads. I had a quite a number of seed beads in different colours and sizes. It was a bit difficult and confusing to choose the colours. 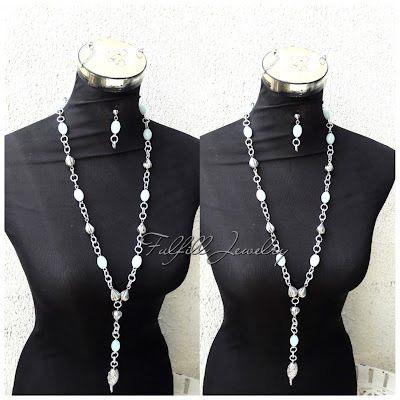 I have seen quite a number of beaded kunmihimo jewelries and I wanted to make something different from the regular. This I intended to achieve either through the colours or bead sizes to be used in this maiden project. I began by adding the beads to the bobbins then began the braids. Along the way, I had issues with my bobbins- two of them actually came off wit the beads! I tell you, it wasn't one of my favourite moments. Eventually, I finished the first one and then added my clasp, a magnetic clasp and my very first time to use it. My daughters could not get their hands of it. It was fun and they just kept wearing and playing with the clasp. For me, I just loved the colours...the softness. I knew I have achieved that yearning of making something a bit different.. The second piece came immediately and I just randomly combined the three colours in 2 of the bobbins, and each of the colours on 2 bobbins making a total of 8 bobbins used (for both bracelets). This is the result, with the same magnetic clasp but a different bead cap. Well, I must say, it was an experience as I learnt quite a thing or two along the way....Let me share it with you. First, I got to know that the you can actually use wire for braiding which I hope to try and of course share with you. Secondly, for the glue to stay put real hard, you just have to sand paper the inside of the bead cap. This would give a stronger hold and tension when you eventually glue. I hope to try out the wire braids some day, but meanwhile, this is what I have got!